Monty: Gadget luv? Could you possabley bring that bicycle pump over here? Monty: I learned this move when i traveled with a group of rowby biker Galapagos turtles.......... Its called me shrink n sneak......they'll never see me come'in! Monty: This reminds me of the time I participated in the Philadelphia Experiment! 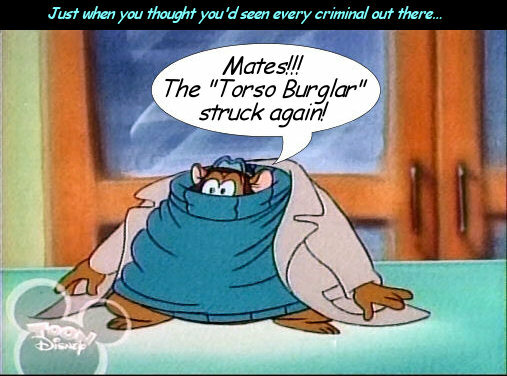 Monty: Who wrote this episode, Tex Avery? Loneheart - Ding, dong, the mouse is flat. Which old mouse? The Aussie mouse!.. Monty: I'm melting! I'M MELTING! Oh curse you and your little dog too! Monty: See? SEE?! *This* is why I don't like goin' t'see a bloomin' shrink! Monty: I really, really, really hate birthday sweaters. MONTY:. . .and this is how I fooled the Two-Tooth Tortoises of Turtle Island into making me their leader! Monty: Word of advice, mates... if Gadget offers to show you her new homemade liposuction machine, you should politely decline. Monty: So this is what happens when your unscrew your belly button. Monty: I don't recommend the new "Anvil Chorus: 3D" at the IMAX! Monty: Your skeletal destabilizer works like a charm, Luv. Now change me back. Gadget, offscreen: Oops, we have a problem!